Utilizing the “Paths to the Top of the Home Run Charts” homerun charting tool, it’s easy to compare the home run production of the three members of the 600 Home Run Club: “Say Hey” Willie Mays (660), Ken Griffey Jr. (630 and counting) and “Slammin’” Sammy Sosa (609) at different ages and various portions of their career. 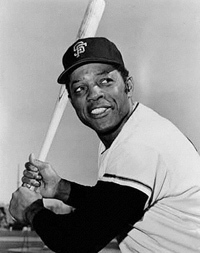 Willie Mays had good power numbers (with 20 home runs) and hit for average (.274) during his rookie season of 1951, but he missed most of the next season and all of 1953 while serving in the Army. After returning to the New York Giants, he made up for lost time by hitting 41, 51, and 36 round-trippers over the next three years. And, as the chart shows, Mays’ home run tally continued at a very steady rate until the last few years of his 21-year career. In fact, he has the most consistent home run trajectory of any of his peers. According to Willie, “You should play as long as you can and as long as you enjoy the game. In '73, I wasn't enjoying the game, so I quit in May and announced my retirement, and they wouldn't let me retire. So I finished up in the World Series,” Mays said. “I tell young players ‘play as long as you can, because you only have one chance.’"
By comparison, Sammy Sosa relied on speed more than strength during the early part of his career, stealing 30 more bases (67) than homers hit (37) during his first four years in the league. 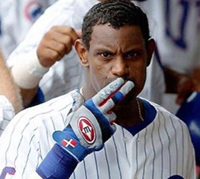 But after he got comfortable in the homer-friendly confines of Wrigley Field on Chicago’s north side, Sosa’s annual home run output became the thing of legends. Check the chart and you’ll see that between 1998-2001, he averaged 61 homers per season, with one home run (and one very famous home run hop) thrilling the Cub faithful every 14.5 times he stepped up to the plate. During one stretch in the fabled 1998 “Home Run Chase” with Mark McGwire, Slammin’ Sammy hit a unbelievable 20 home runs in just 26 games…before pitchers simply stopped throwing him hittable stuff. But Sammy just kept swinging away and blowing kisses to his fans. 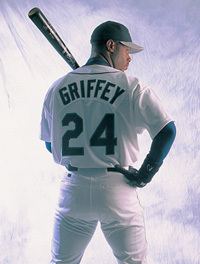 With 630 career home runs, Ken Griffey, Jr. is fifth on the list of most career home runs with the most home runs of any active Major Leaguer. Along the way he tied the record of most consecutive games (8) with a home run. Once considered to be the best threat to break Bonds’ career home run record, Junior blasted his way up the chart from age 26 to 31, but was hampered by injuries and never regained his early career home run pace. Now that Seattle has resigned him for one more season, Junior will have a chance to come up big.